Vegetables grow in abundance in this solar green house in Sandy Lake. Darrell and Linda Frey depend on their biosphere for crops, many of which are sold to restaurants in Pittsburgh. Entering the northwest corner of the contemporary structure, which resembles a large wooden chalet, a flock of chickens come bobbing and waltzing along, pecking at the food being dished out by Darrell Frey. He pets a couple of the chickens _ which produce eggs for his wife, Linda, and their three children before filling a water container. A set of doors leads into a wonderland of crops, literally a forest of food. The temperature outside is in the mid-30s, but crops inside this massive solar greenhouse enjoy a 70-degree environment and produce luscious flowers and leaves. A series of greenhouse tents outside produce much the same mix of food, but on a smaller scale. Some of the crops in those tents all grown organically without chemical fertilizers _ have already been harvested as the Freys and their Three Sisters Farm in Sandy Lake scramble to meet customer demands. The couple said people are becoming ``absolutely'' more interested in organic foods. That includes the people who operate upscale restaurants in Pittsburgh, who have become a mainstay for these organic farmers. ``Right now, we're selling about 30 pounds a week of our salad mix,'' Darrell said. But it's far from your typical salad. The Frey's mix includes everything from mizuna and chard to chick weed and watercress to pea greens and tac-soi, intermingled with an assortment of edible flowers. Chefs also buy plenty of fresh herbs from the local farm. ``A lot of restaurants really want to have a connection with a small farm,'' Linda said. The fact they she and her husband operate an organic farm is a plus in the minds of many of those chefs. The Freys are committed to the concept of organic farming. ``I really don't emphasize the negative of chemical farming as much as the positive benefits of having a healthy soil and not polluting the groundwater,'' Darrell said. He and his wife still buy some foods from the grocery store, which are probably grown with the help of chemicals, he said. Unfortunately, most Americans accept technology without realizing the consequences, Frey warned. ``Our world has been moving much too fast and we take on technologies long before we evaluate them. ``For instance, as a society we pretty much rejected building new nuclear power plants. But it took a long time and a lot of battles before government and business realized that it wasn't safe or healthy. The Freys rely on compost, chock full of living and breathing bacteria, and organic rock dusts to encourage a healthy soil and to help keep their crops healthy. ``But the other thing with us,'' Darrell said, ``is to encourage a diversity of life around the garden. Bird houses attract winged insect eaters to their five-acre farm. And when rocks are not being used to hold down fabric crop covering, they go in buckets and become home to snakes, which help control rodents. ``This looks weedy,'' he said inside one of the free-standing greenhouse tents, ``but we put a lot of wild edibles in our salad mixes. ``This is wild daisy green, chrysanthemum. This is chickweed. And these are pea greens,'' Frey said as he walked the farm. The Freys will plant several varieties of crops together, wasting little space in between. It's a take-off of a Chinese form of gardening, explained Frey. He and his wife describe themselves as ``lifelong learners'' and have tried different gardening techniques over the years. ``Every farmer has a different method,'' Darrell said. High mounds of compost, complements of the Great Stoneboro Fairgrounds, lay to the north of the farm, nestled between a greenhouse tent and a section of raised ground that is green with new crops. Across the field are wooden tee-pee trellises that were used last year as part of a tomato growing experiment. Results are mixed, he said. 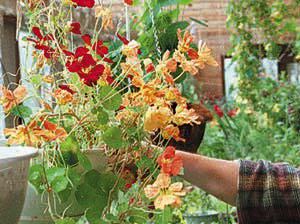 Minutes later, Frey is raising the tops of hot frames on the east side of the greenhouse, also known as a bioshelter, revealing edible flowers of all colors and shapes. Back inside the bioshelter, Linda Frey is watering plants on the balcony of the structure, which was built in 1988, with the help of a state grant, a bank loan and personal funds. Both he and Linda worked at Polk Center before retiring and beginning their organic farm. Darrell also has started a consulting and education business to teach others about organic farming. Along with solar power, the Freys use an old wood burner and compost to heat the bioshelter during winter months. A row of compost chambers are built into the west wall of the structure. As compost decomposes it gives off heat, which is forced through a network of ducts with the help of an electric fan. ``Having enough customers is not at all a problem,'' Linda said. But she wishes she could find local restaurants interested in her organic garden fare. Darrell said he believes most farmers are concerned about the enviroment. He also believes there will be a massive movement away from the indiscriminate use of chemicals. It's already happening, he said. State agencies are advising farmers to cut back on chemicals. Oftentimes people will ask if organic farming can feed the world's population, Frey said. ``Well, it fed the world until 40 years ago,'' when chemicals were introduced into farming. Copyright ©1998 The Sharon Herald Co. All rights reserved.